Coconut Oil: Bad for Your Heart and Waistline? Home » Food and Nutrition » Does Coconut Oil Deserve Its “Superfood” Status? Does Coconut Oil Deserve Its “Superfood” Status? The news I’ve heard (and you’ve likely heard, too) touting the benefits of coconut oil makes it seem like one of the key ingredients is magic. Coconut oil is said to do just about everything: prevent Alzheimer’s, help you drop pounds, reduce cholesterol, prevent heart disease, improve your teeth, improve digestion, and a number of other amazing benefits. What’s even more interesting is that this so-called superfood was previously vilified during the “war on fat” during the eighties and nineties and again in the early 2000s. Coconut and other tropical oils bore a lot of the brunt because they are high sources of fat. In fact, coconut oil is one of the most concentrated sources of saturated fat available (saturated fat is typically found in meats; think of the white marbling on your steak)—even more so than butter—and has been billed as a threat to health problems it is now said to cure! Well, I’m a firm believer that if something sounds too good to be true, it just may be. I always do my research first before buying into the headlines, and while coconut oil may be a better choice for your health in some instances, I’d contend that some of the benefits of coconut oil are grossly overstated. One of the biggest, and potentially most dangerous, claims about coconut oil is that it’s good for your heart. Most saturated fats raise cholesterol, but the different sources of saturated fats can have varied effects on your cardiovascular system. Research (albeit limited) has indicated that coconut oil’s saturated fat is more neutral with its effect on cholesterol than meat, much like dairy or chocolate. What does that mean? Well, depending on how it’s used, it can have varying effects on your cardiovascular system. In some cases, it can have little impact; while in others, it can raise your bad cholesterol and total cholesterol. When conducting my research, I came across one study that showed that young, obese women who consumed an ounce of coconut oil per day for 12 weeks experienced an increase in both their HDL (good) and LDL (bad) cholesterol levels. However, their overall cholesterol ratio was improved because HDL went up more than LDL. So while it may not be terrible, it’s also not good, as there were still increases in overall cholesterol, which is bad news for your heart. Many people tend to introduce coconut oil as a replacement for something else. Depending on what it’s replacing, the effects on your cholesterol might be different. For example, if coconut oil is taking the place of a polyunsaturated fat, like vegetable oil, it’s likely to actually increase LDL. But if it’s replacing butter or lard, it might be neutral—or it could perhaps lower your LDL level. Coconut Oil’s Role in Weight Control True? Coconut oil is also known for playing a role in weight control, which is highly overstated. It comes from the fact that its fat content features medium-chain triglycerides (MCTs) that require more work (or more calories to be burned) to break down than more common long-chain triglycerides. But the difference is negligible. At 120 calories per tablespoon, and made predominantly of saturated fat, coconut oil isn’t exactly something that promotes a smaller waistline. If you want to cut down on your use of butter or lard and use coconut oil, it might be a slightly better alternative. However, it’s probably better to use vegetable or canola oil. When it comes to coconut oil, be sure to do your research and don’t always believe the hype. 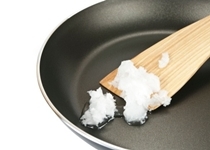 “Is Coconut Oil a ‘Miracle’ Food?” University of California, Berkeley web site, November 6, 2014; http://www.berkeleywellness.com/healthy-eating/diet-weight-loss/food/nutrition/article/coconut-oil-all-its-cracked-be. Assunção, M.L., et al., “Effects of dietary coconut oil on the biochemical and anthropometric profiles of women preventing abdominal obesity,” Lipids July 2009; 44(7); 593–601, doi: 10.1007/s1175-009-3306-6.